Et multi leprosi erant in Israel sub Elisaeo propheta : et nemo eorum mundatus est nisi Naaman Syrus. Fr Dwight did an excellent article, drawing on the writings of CS Lewis, about the Inner Ring mentality that allowed for the recent scandals to root, evolve, and stay hidden. All it takes is one whispered secret. There are no passwords, no secret handshake, no admission nor expulsion; it is a secret society nonetgeless. Lewis' point is that this happens everywhere: not just in Church. It seems to be part of humanity's fallen nature. When Scarlett O'Hara first sees Rhett Butler at Twelve Oaks, she's told "he isn't received" meaning that no proper, polite family will welcome him into their home. But here he is, at Twelve Oaks. If the Wilkses have let him in to their home, suddenly, he is now, received. So it's ok to be seen with him. That's the way a real inner circle works: the very definition of "Not what you know, but who you know." We want to be in there, right? We want to be on the inside. Ask me how I feel about being "in the Dominican Family". I heard recently of a deceased priest who would navigate through the silent canon of the Latin Mass (in the days before the V2 council) saying "wordy wordy wordy" soto voce. I know an Orthodox priest who skates through the Liturgy of St John Chrysostom by only saying aloud the words of institution. The rest of the Anaphora takes maybe 1 minute or 2, glanced at briefly whilst the Choir sings the Sanctus and the "We praise you". As this is the normal practice in many parish churches I visited during my 12 years of Orthodoxy, I can't say it's odd. Someone (or several someones) must have known about Fr Wordy's practice, because the Silent Canon is silent... so... someone didn't call the Archbishop. 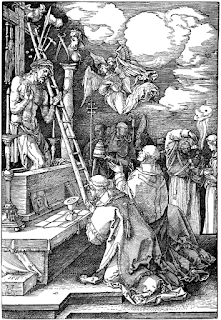 The print above shows Christ rising from the Altar in a style that will be familiar to many Orthodox and Byzantine readers as "Christ the Bridegroom". He is appearing on the altar during Mass offered by Pope St Gregory the Great in response to the latter's prayers who asked that an unbeliever in the room might be shown the Truth of the Eucharistic Miracle. In this most common and universal of miracles, the very Body and Blood of Christ, living, eternal, human, and divine, is made present on the Altar in the forms of Bread and Wine. It's St Gregory's Feast today on the New Roman Calendar. St Pius X is celebrated today on the older Calendar. Either way, today is the feast of a Pope who taught the historic faith in times of trial. Both Popes faced clergy who were at odds with the teachings of the Church. Both Popes had wins and losses in that face-off. 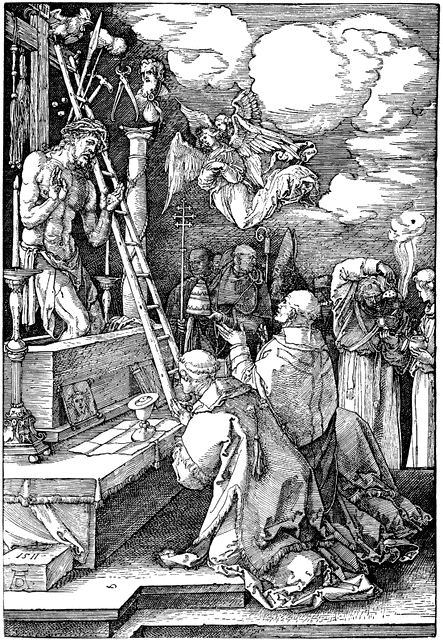 St Gregory dealt with lax clergy living lavishly in Rome. He created a monastery and put everyone under monastic obedience. St Pius dealt with modernists denying the faith and created the Antimodernist Oath. And both Popes are makes as great reformers - notably in both cases, of the Daily Office. It is prayer that fixes the inner rings of the world, by opening them up to God. The Bible readings underscore that sometimes God not only acts in spite of the "inner circle" but sometimes goes right outside the Church. The cited cases (of Elijah and Elisha) highlight how God's prophetic actions required Gentiles, that is non-believers. When you find yourself facing non-believers inside the Church, you need Gentiles to back your reforms. You may need to even let in the Government Officials. Then we can preach the Gospel, because we're living it. But we shouldn't be surprised when it's not happening: because it's been not-happening right along.